is to use any one of our three methods described here. You don't have to have experience if you use our patterns. We make it easy. and then allows you to select the one you like the best! Can't decide? Select all three! Click on any one of the three examples for complete instructions to see how easy it is to use a log cabin quilt pattern for your next adventure. We hope you will try to create any one or all of the blocks. 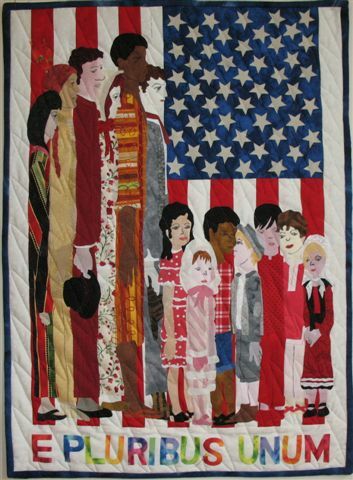 The traditional log cabin quilt pattern has three dark fabrics and three light fabrics plus a center square. Three of the strips will be a neutral color and the other three strips should be darker colors. Cutting and sewing strips together by going in a clockwise direction around the center square is the method used most often. Let's begin by making a paper template to track the order in which your fabrics will be laid out. 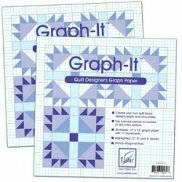 Draw a template, using graph paper, based on the log cabin quilt pattern you want to make, (traditional, courthouse steps, or pineapple). Glue swatches of your fabric onto the paper template and add the number of each log. This will help you remember color placement. 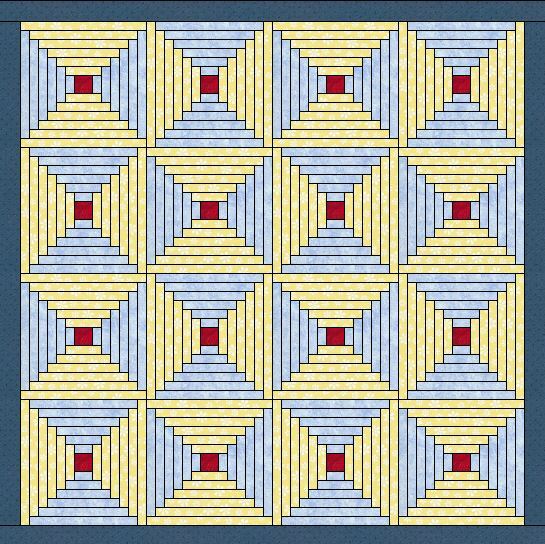 June Tailor makes a 12-inch square tablet of individual sheets of graphing paper for quilt designers to design quilt blocks. You might want to give it a try. This paper is a commercial grade art paper and accurately marked with true half-inch squares for accuracy. This is very important. A layout key and a fabric key is important for those of us who have trouble remembering the sequence of the 'logs' and believe me that is probably all of us. 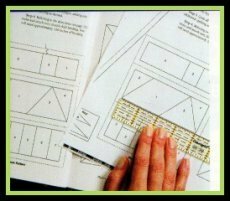 It helps when you draw a log cabin block and pin or glue fabric samples to the drawing to help remember the color placement. 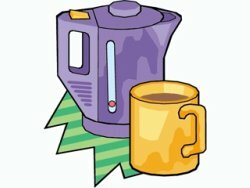 Its simple things like this that makes quilting easy. What happens when you place your strips under the presser foot. 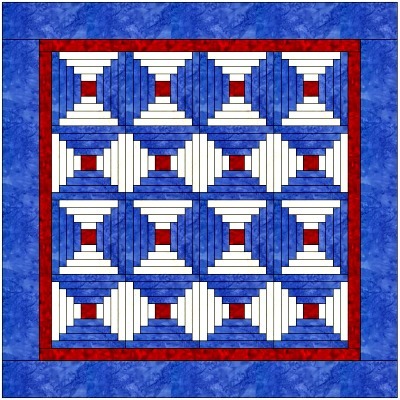 It is plain that the strip placed under the presser foot becomes the next log in the log cabin quilt pattern. That's why it is important to follow the fabric key. STEP 1 - Cut 4 - 2 ½-inch squares for the red center of each block. STEP 2 - Choose a 2 ½-inch strip of the lightest neutral fabric and place it under the presser foot. See the fabric key above. 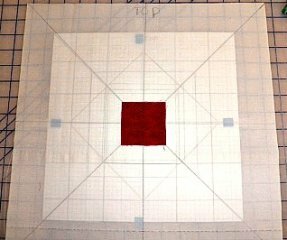 Lay the 2 ½-inch red center square – one at a time- on top of the strip and sew down. Leave as little room as possible between the red squares. Repeat this until all 4 of the center squares have been sewn down. Cut apart and discard the scraps. Open the sets and press with the seam away from the red center. STEP 3 - Select another 2 ½-inch strip that is the same fabric as the first one (lightest of the neutral fabric) and place it under the presser foot; sew the pieced rectangles you created in step 2 to it. Lay the rectangle down one at a time and sew. Repeat until you get all four of the rectangles sewn. Using a ruler and rotary cutter, cut the blocks apart discarding the in-between scraps. Open the sets and press with the seam allowance away from the red center. STEP 4 - Select another 2 ½-inch strip that is Lightest of the dark fabric and place it under the presser foot. Be sure to follow the fabric key above. Lay the 4 ½-inch square you just created in the steps above on the strip and sew the square to the strip. 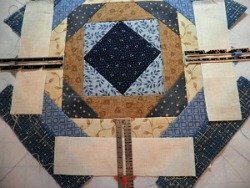 The strip placed under the presser foot becomes the next log in the log cabin quilt pattern. Cut apart; press seam and add one more strip as outlined in the fabric key chart above. STEP 5 – Repeat this procedure until all the fabric strips have been added to the log cabin quilt pattern. Make a gift for your sweetie! A Traditional 6-Block couldn't be easier! I just chain stitched a table runner using the four blocks and will use as a Christmas gift. It took a little over an hour using scraps I already had on hand. My husband calls me the gift giver. 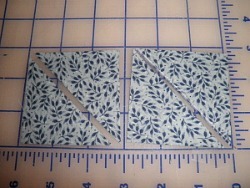 So you can see that it is easy to see that chain piecing is quick and easy. Vary the width of the strips if you want your block smaller. This is a 14-inch block when finished. All the fabric strips were 2 1/2 inches wide (including seam allowance). 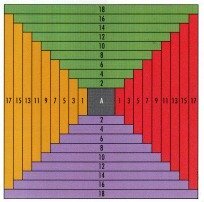 Paper piecing is the second most accurate way to make the log cabin quilt pattern. It involves using a small stitch length when sewing strips to a tear-away paper foundation. Logs do not have to be cut to a precise size. 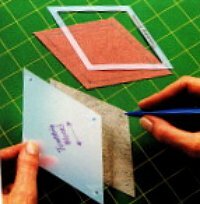 The width should follow the template and uniform in size; the length can be trimmed as needed. 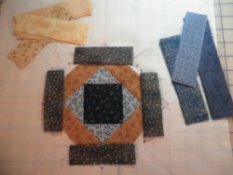 Paper piecing is a speedy way to make a log cabin quilt pattern because the fabric is trimmed as you go and remains in tact until the top is finished. The paper gives the block added stability and should remain attached until the top is finished. Once the paper is removed, the block is pressed and ready for quilting. Cheap copy machine paper that is thinner is easier to work with and can be found at discount stores or online. You need to double the normal amount of yardage that you think you may use because of all the waste in clipping and trimming. 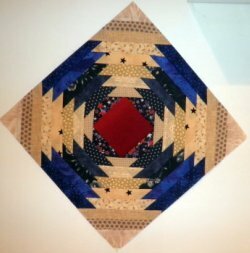 You will need a number of copies of the original courthouse steps template to make this log cabin quilt pattern. Photocopying a pattern seems an easy way to solve this issue but use this method with discretion. All copy machines distort in at least one direction. So first compare your original to one of the photocopies. Then check the copy against the original pattern for accuracy. Computer printing has advantages over photocopying. 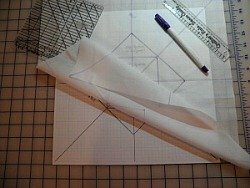 You are only limited by the size of your printer and the ability to draft your pattern accurately on your computer. ﻿Cut along the bold lines on the outer edge of the template copies. On the marked side of each pattern, write the color to identify the sequence in which to add each piece of fabric. Remember all patterns are reversed on the paper copies. Place the fabric right side up on the back (unmarked side) of the printed block. Hold the block up to the light to make sure you have covered the space with fabric and extended around each side by a quarter inch (seam allowance). Add a small drop of water soluble glue on the paper to anchor the first fabric piece until the second fabric is sewn. Turn block over and fold the paper toward you along each outside line of the block. Trim with scissors leaving a quarter inch of fabric. Allow 1/4-inch of fabric to each side of the second piece to be sewed. 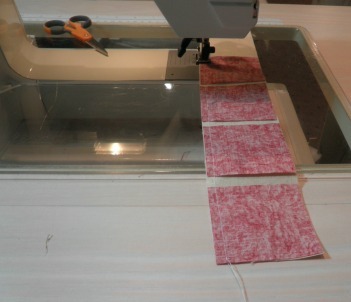 Note: if you have precut the fabric strips you will no longer have to measure and cut. Place the second piece right side down and on top of the first fabric. One edge of the second piece should be even with the stitched edge of the first piece. Set your machine at 18-20 stitches per inch so that later the paper will tear away from the sewing line easier and avoid loose threads after the paper is removed. If all strips are the same width you can precut the strips and have them ready to use. 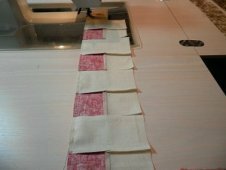 The length of the strip can be sewed and cut to length as you go along. Hold or pin the pieces together; turn over and sew along the quarter inch seam. Start 1/4” ahead of the line and 1/4” past the line. There is no need to backstitch. Trim excess fabric from the seam. Fold the second piece to the right side and press flat. Continue adding strips in the same manner until all strips have been added. You will get something like this block. 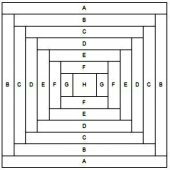 Foundation piecing involves the use of a separate material as a base to aid in the piecing process. The process is quick and speedy because no templates are needed. The sharp prickly corners and angles resemble a pineapple which is most likely why the quilt is called just that. 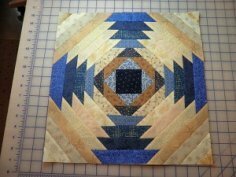 The Pineapple Log Cabin Quilt Pattern uses four dark logs and then four light logs to achieve a ripple effect that encircles the middle square. Draw two diagonal lines from top right corner to bottom left corner crossing in the middle of your 12-inch graphing paper. From top to bottom (center) on your paper, draw another line. From side to side (middle) on your paper, draw yet another line. Fold the paper in half and again in fourths to get an accurate center line. 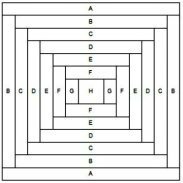 From center point (where all the lines crisscross) place a 4-inch square ruler matching all the lines of the ruler with the lines on the paper you just drew. Make sure the ruler is horizontal to the top of the paper; the same way the red square of fabric will be placed. Place a 6-inch square ruler on an angle and over the top of the four inch markings. Mark the outer sides. Be sure and align all the ruler markings to the ones on the paper. Your drawing will look something like the image above. 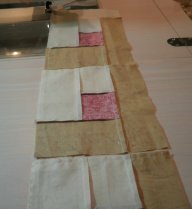 You will also want to add a few of the one inch grid lines both vertical and horizontal which will aid you in keeping the logs straight when sewing the logs to the muslin. The dark ink lines on the paper will show through the muslin and allow you to transfer your markings with ease. If you have trouble seeing the markings tape the template and the muslin to an outside window and mark. A light box works for this step too. Start by cutting a 16-inch square of lightweight muslin. Make sure the square is large enough to cover your template. Lay the square of muslin on top of the template and transfer the markings to the muslin. Cut the small center square and mark the center by folding into fourths; press. 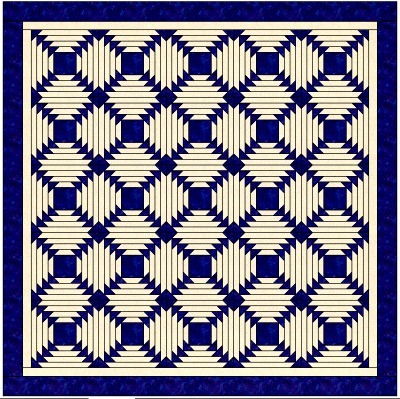 Note: the size of the center square governs the overall size of the finished block. 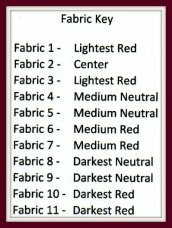 Match the centers of the red center square and the muslin square and tack it in place with a spot of fabric glue or baste using a needle and thread. Be sure the red square faces up. Cut or Tear a supply of light and dark fabric strips to the width of 1-1/4 inches. This width includes the seam allowances. The strips will be trimmed to the correct length as you construct the block. Start by placing a light strip on one side of the red center square. Match right sides and stitch all three layers together. 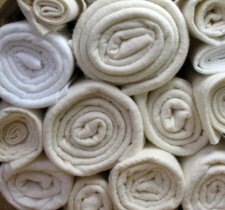 (muslin, center square and first log). Press seam away from the red center square. Repeat this for the other side of the center square. 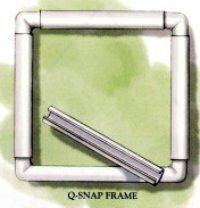 Trim the ends so that you now have two logs and one middle square with the inter square measuring a quarter inch bigger than the outer logs. 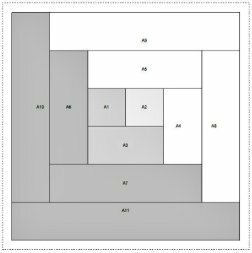 Alternate between adding pairs of logs to the top and bottom and then to the sides of the square until the block is the desired size. 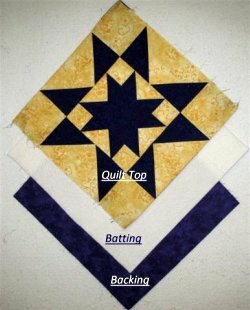 This beginner quilt pattern is traditionally pieced with all dark fabrics on the top and bottom and all light fabrics on the sides creating the illusion of steps surrounding the center square. Lay the muslin on top of the paper template, right sides up, matching centers and other lines before you start to mark on the muslin. Transfer all your markings from the 12-inch paper template to a piece of muslin fabric. Note: this paper template will be used over and over again until the quilt has been finished. We now have a marked 12-inch paper template and a 14-1/2 inch piece of muslin that has been marked . 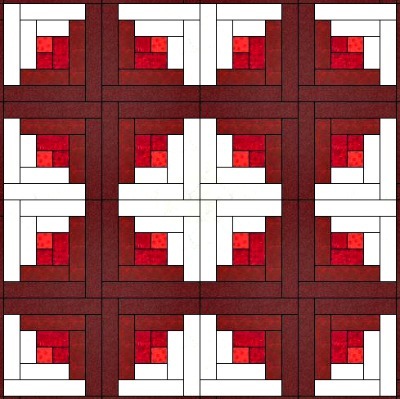 Start with a small square of red fabric to be used for the center of the block. 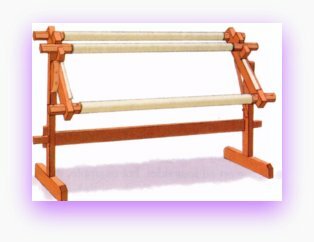 You will also need four different light and four different dark strips of fabric for your logs, along with your marked muslin foundation on which to sew your strips. The finished width of each log can be anywhere from one inch to 2-1/4 inches. Fold the small square into fourths and press with the iron or finger press to get an accurate center point for the red square. 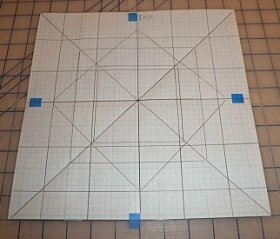 Center a 15-1/2 inch piece of muslin on top of your 12-inch graph paper design. The dark lines on the paper should show through. 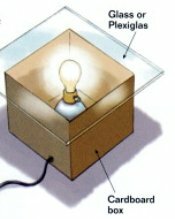 If the quilt design is not clear enough to draw easily, you may need a light table or an outside window on a sunny day. Using an evaporating water soluble pen, transfer your lines to the 15-1/2 inch muslin square. The more humidity in the air the faster this type pen will evaporate so you must work rather quickly or you can also remark the design when necessary. 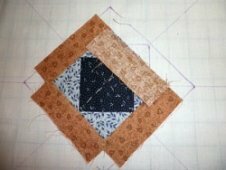 Once you transfer the design from the graph paper to the muslin square, lay the paper graph aside to be used for each of the other squares in your log cabin quilt pattern. 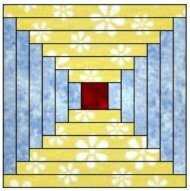 Or save for any future Log Cabin Quilt Pattern using a pineapple design. Place a 3-inch square of dark printed cotton in the center of the muslin fabric. Make sure that the edges of the square are parallel with the top, bottom and side edges. 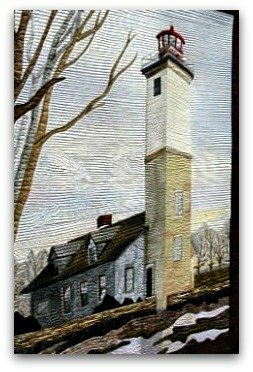 Once it is centered place a dab of fabric glue or baste it with a running stitch following the horizontal lines on the muslin square. 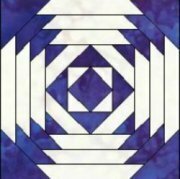 Cut two 2-3/4 inch squares of a medium printed cotton; then cut the squares on the diagonal to form four 3-3/8 inch right-angle triangles. 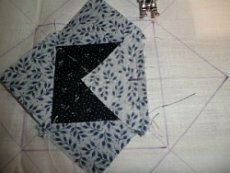 Match the 3-7/8 inch side of each triangle to the 3-inch square and stitch in place using a small stitch between 18-20 stitches per inch. Press seams of the triangle away from the center. 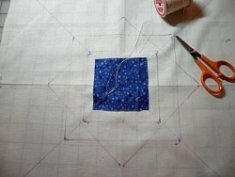 The edges of the triangle will follow along the marked edges of the 4-inch square drawn on the muslin. Cut four 4-inch logs from a light print 1-1/2–inches wide. Match the raw edges of logs to raw edges of triangles and stitch using an 18-20 stitches per inch. Press seam away from center. Cut four 3 1/4-inch long strips from dark print 1 1/2-inches wide. Match the raw edges of logs to the 5 1/2-inch square as a guide and stitch. Press seam away from center. Continue to cut logs from both the light and dark prints. The logs will always be l- l/2-inches wide by 6 or 7 inches long. I sometimes cut my logs 8 inches long just to keep the “rip outs” at a minimum for this log cabin quilt pattern. Measure 1 1/4-inches beyond the preceding strips you just added and mark to use as a strip placement guide. When you lay a log on top of the block, align all four logs to make sure the reveal is uniform distance from the previous log before sewing. This keeps the “rip outs” at a minimum. Continue to add rounds of dark and light strips in the proper order until desired size has been achieved. Complete the four corners by adding strips of dark logs until the corners are completely covered. 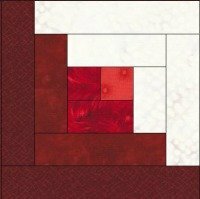 Square up block to match edge of muslin lining.This is a beautiful quilt design and an easy quilt pattern. Enjoy your log cabin quilt pattern using the pineapple version! Don't let the pineapple log cabin quilt pattern be intimidating...it is fun. Making a Template is Easy if You Know How! Perfect for your Sweetheart...see who's the fastest! 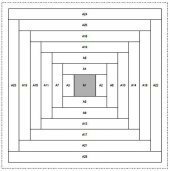 I saw on the yahoo group that you are going to post the pattern. Thanks!!! I really like your patterns. I have already printed out a couple of them. 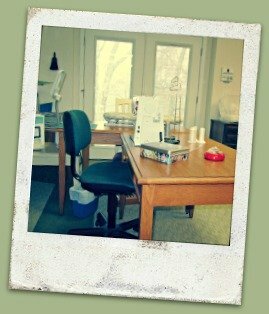 I am a beginning quilter and find your site great! Thanks for a great website. Looking forward to the other Sunbonnet and Sam patterns. My youngest grandson is named Sam so that is my next quilt! This is Jenene's beauty! Looks great too!